*My mother has never once said this. Calories: 80 calories per bottle. The Taste: It’s like, mid-range apple-y. It certainly doesn’t have that “over-ripe” taste that other ciders do. It’s ever-so-slightly tart. Quite sweet. The Mouthfeel: Not particularly carbonated. I suspect if it were more carbonated, I would like it better. However it isn’t cloying. So… s’ok. The Nose: Very light. Imparts more of an impression than anything. It seems “fresh”. Quite nice. My Nose: A little wide, but balanced overall. The Colour: Very light. A little greenish, but not in an unappealing way. The Final Verdict: Maybe like a 7? I like it better than the last few ciders I’ve reviewed. 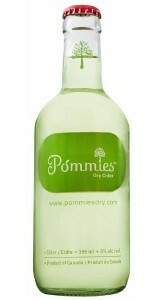 Somehow Pommies just seems… feminine in general (possibly I’m biased re: packaging/bottle). Overall, though I feel like it’s very accessible. I could see bringing a pack of these to a BBQ and then getting a little pissy because they’re all gone right away. Have you tried it? What’d you think? Rate it and let me know about your experience in the comments below. This entry was posted in Cider Review and tagged Apple Cider, Canada, Canadian Cider, Cider, Cider Review, Dry Cider, Gluten Free, Hard Cider. Bookmark the permalink.